Unlike other pictures by the photographer Albert Levy, here we can see a man and also a carriage. Pictured is one of the first street lamps were beginning to spread in the major U.S. cities in the second half of the nineteenth century. Albert Levy's Photographic Series of Modern American Architecture. Due to these series, Albert Levy is referenced as counterpart for Alinari in the United States (13). Architectural Photographic Series, city houses/Levy: 1 album, 38 leaves of plates: photographs 36x46 cm. New York, Albert Levy (between 1880-1895?). (20). 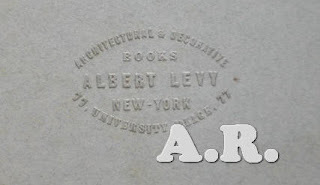 Signature by Albert Levy in "Albert Levy's Architectural photographic series"
"Architectural & Decorative Books, Albert Levy, NY, 77, University". - A study in 34 1/2 Pine Street, NY in 1887 (3). - At the same time he also had a study in France, 19 rue de la Chaussée-d'Antin, Paris (3). He is also referenced as bookseller (2). Albert Levy is referenced as the photographer who began the manufacture of the gelatin dry plates in 1878. All references can be found in the book Photography and the American Scene. A social history (1839-1889) by Robert Taft. See (5), (6), (7) and (8) for full text. Albert Levy is also identified as "early competitor of Eastman, NYC" (9). This reference relates also to the book by Robert Taft (10). The Bibliothèque Nacionale the France (2) and the Avery Architectural and Fine Arts Library (20) own a catalogue of 2500 titles by Albert Levy as editor in New York and Paris for Architectural photography. Fotografia antigua Ares del Maestre Castellón.